• 10 way pluggable and networked addressable LCM. • Switched and dimmable DALI broadcast, DSI, 1-10. • 3 independent channels (4, 4, 2). • 5 RJ12 sensor inputs. • 5 dry contact closure switch inputs. • 2 RS485 network ports. • Emergency light test facility. • Alarm override switch input. 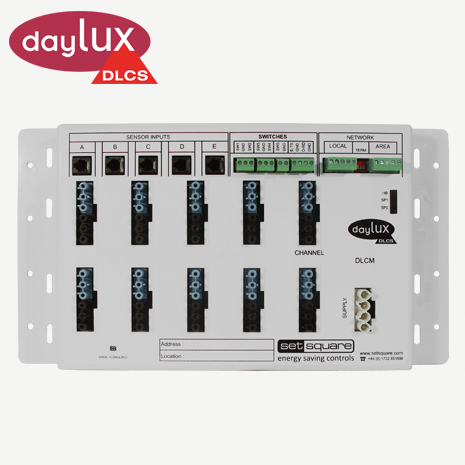 The DLCM3 is a ten way pluggable Lighting Control Module (LCM) programmed by front end software as part of the Daylux Lighting Control system. Each output provides power, a dimming signal and a switched power feed for the emergency battery to the light fitting. Presence and light level sensors are wired directly back to the five sensor ports using plug and play RJ12 leads. Each unit also incorporates a programmable feed through relay which enables a centralised manual test facility for the emergency lighting.